From the first convent for African American nuns on not-so-saintly Bourbon Street to a temple-turned-treehouse, these Stash hotels have some holy history. Alright gumshoe, you guessed it —The Priory Hotel was once a priory. In 1888, the Benedictine monks built the priory as an addition to St. Mary’s Church. For over 75 years, monks and priests lived in residence as they served the local community. In 1970’s, the Pittsburgh DOT announced that the church and the priory were in the path of a newly planned interstate.The building was shuttered and assigned a demolition date. However, with their Pittsburgh steel will, this parish was hell-bent (heaven-bent?) on staying put. After long appeals and perhaps divine intervention, the DOT agreed to reroute the highway to appease the good folks of St. Boniface. This rerouting coincidentally rescued St. Mary’s from the wrecking ball, but the parish had already been dissolved. The city put the church and priory up for sale in a public auction where it was snatched up by a couple with a passion for historic preservation—Ed and Mary Ann Graf. If you need another sign that this was meant to be: only after the purchase was complete did Ed Graf learn that his great-grandfather had been married at the church, and his own father baptized there. Be sure to stop in the tiny Monk’s Bar for a Monktini or a microbrew. Looking to tie the knot? St. Mary’s Church was converted into The Grand Hall, a massive banquet hall with soaring ceilings and grandeur galore. 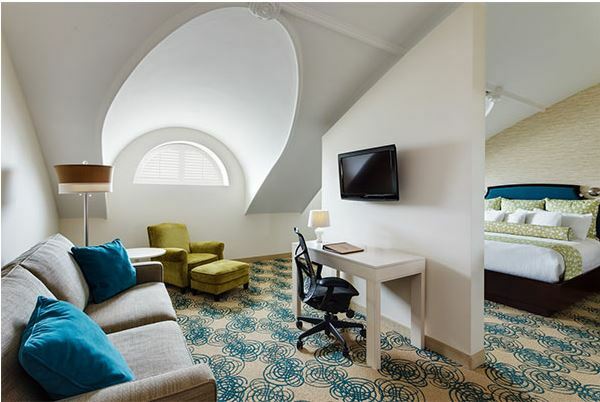 While we have a strict rule about discussing sensitive topics like religion and evolution, we’re going to break the rules for a minute to discuss Hotel Skyler—and its incredible evolution from a Synagogue to a playhouse to an eco-obsessed hotel. 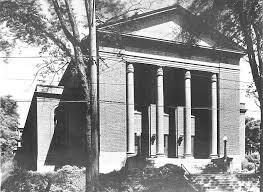 In 1921, the dramatic neoclassical brick building was brought to life as Temple Adath Yeshurun in the heart of the cities lively Jewish neighborhood. The soaring stone pillars led eyes to the inscription on the frieze—which remains intact today. It declares in both Hebrew and English “Open Ye the Portals of Righteousness, I Will Enter and Praise God.” The temple included spectacular stained glass and dramatic arched ceilings. As with The Priory in Pittsburgh, urban renewal and development shifted the dynamics of the city. In the 1960’s, the congregation left the temple to the city as they migrated to another neighborhood. 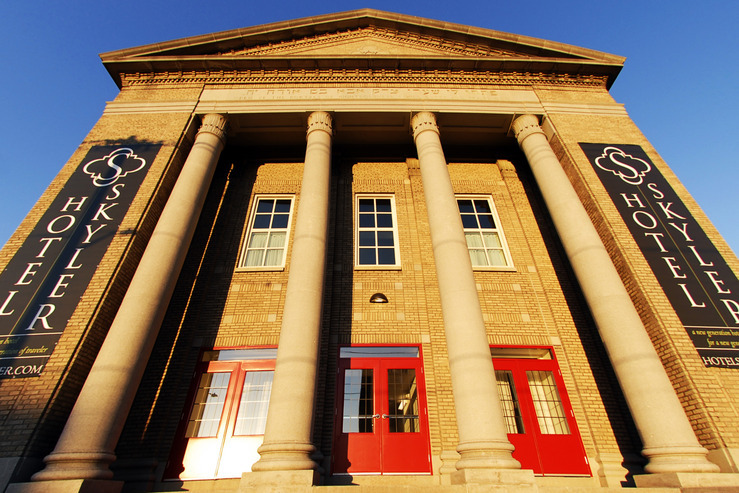 The city, befuddled with what to do with this magnificent building, leased it to a local theater company, Salt City Center for the Performing Arts. This group’s strength was acting, not building maintenance. By 2004, the building was not meeting code and the group was evicted. In 2006, developer Norm Swanson saw life in the old vacant temple/theater. 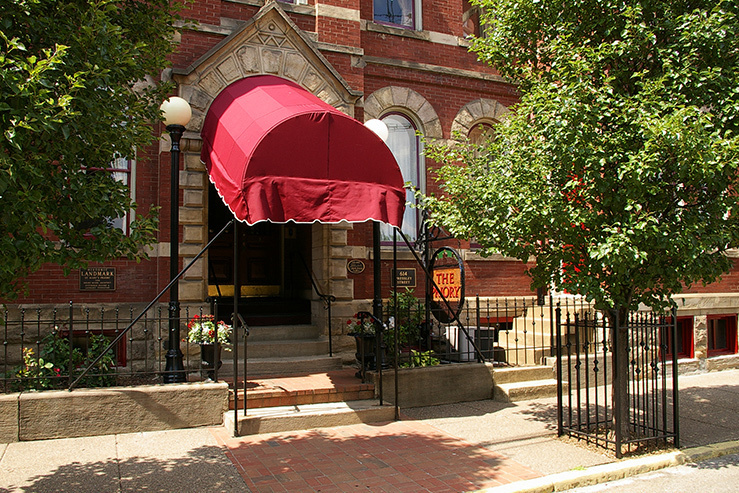 He purchased the building and invested $6.7 million to convert it into a boutique hotel. 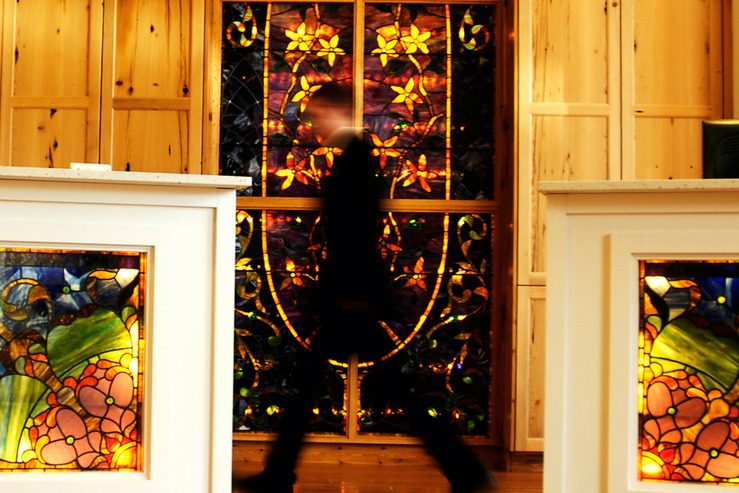 The previous temple had taken the stained glass, so the hotel looked to yet another abandoned religious relic—St. John’s Church in Oswego, NY for replacements. Salvaged stain glass in the lobby of Hotel Skyler. The reclaimed building and salvaged decor is just the beginning of the story of how green this hotel is. Geothermal wells feed the hotel’s heating and cooling system. 20% of the building material s were locally sourced, and the wood is all Forest Stewardship Council certified. While The Priory and Skyler Hotel have obvious religious roots, there are a few other Stash partner hotels had sacred stints too. Cranwell Resort & Spa and Golf Course was once a private residence for the Reverand Henry Ward Beecher, a Congregationalist clergyman (and brother of Harriet Beecher Stowe). Upon arriving on the property he famously proclaimed, “From here I can see the very hills of Heaven.” (Similar words grace the hotel’s TripAdvisor page.) 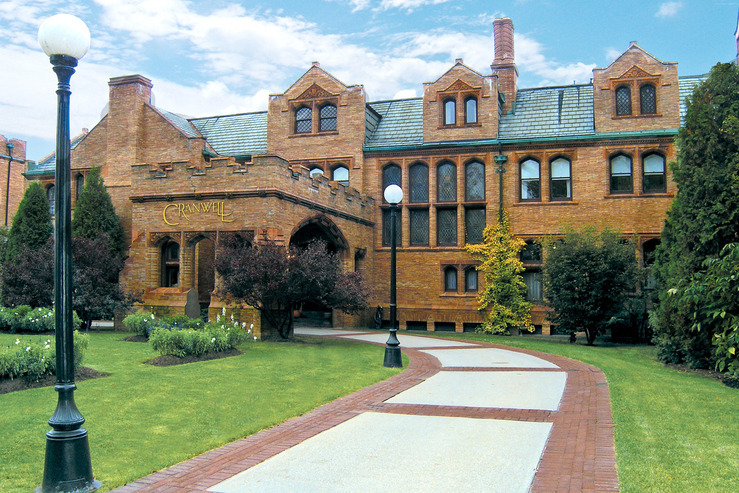 After the Reverend, the property changed hands—estate, bigger estate, even bigger estate, country club—until 1939 when Edward Cranwell purchased it and deeded it to the Society of Jesus of New England where it became a picturesque private school for boys. After 35 years, the school fell into decline. (I mean, how can you expect students to pay attention on a campus this beautiful?) The property found it’s true calling when it opened as 114 room resort, with the tranquility and opulence of a bygone era. The early structures of the Bourbon Orleans Hotel were built in 1817, where the grand Orleans Ballroom and later the Orleans Theater welcomed high-society and government until war destroyed much of the citiy’s nightlife. 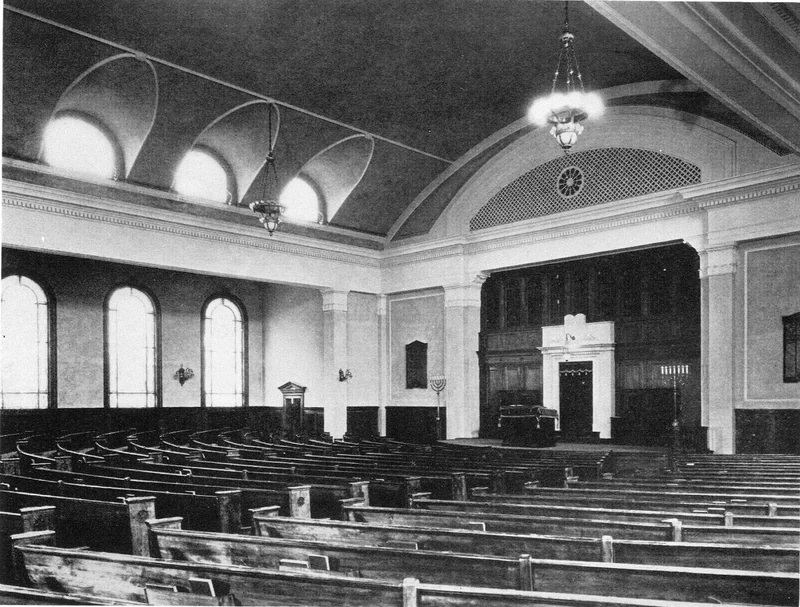 The first convent for African American women, the Sisters of the Holy Family, purchased the ballroom and the theater in 1881 to be used as a convent and school. For the next 83 years, the sisters thrived until they eventually outgrew the space. 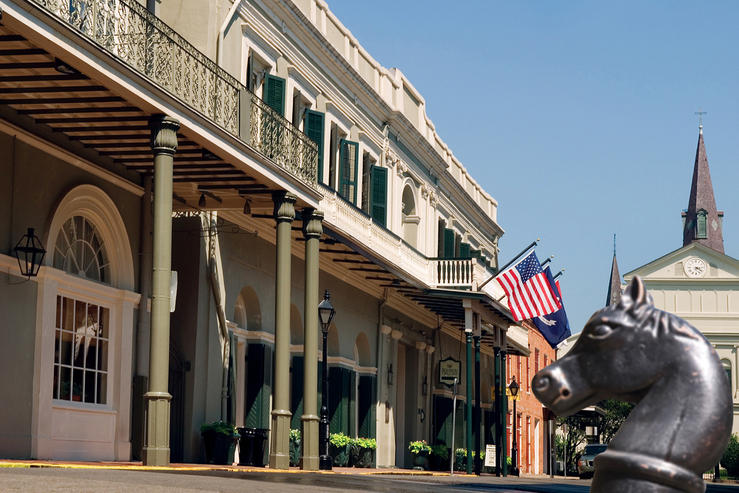 Which leads us to the Bourbon Orleans Hotel and historical hotspot right in the middle of all the not-so-saintly action on Bourbon Street.